UGE International reported this week that it will design and supply a solar microgrid at the corporate headquarters of a U.S. restaurant chain with nearly 200 locations. The company has yet to release the name of the restaurant chain. UGE, which struck the deal in December, values the solar microgrid at over $700,000, making it the company’s largest installation of 2014. The photovoltaic array and battery storage system will be designed to provide cost savings and energy security, according to UGE. 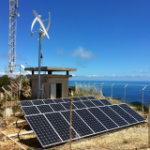 Track new microgrid projects by following us on Twitter at @MicrogridNews. The storage will supply at least three hours of off-grid backup power if a grid outage occurs. “Solar energy is ever more compelling from an economic standpoint, providing our clients with cost savings from day one. In addition, when combined with energy storage, we also improve energy reliability by meeting the critical demands of our customers’ businesses,” said Joshua Rogol, UGE director of Business Development at UGE. UGE expects to complete the restaurant chain solar microgrid by mid-2015. UGE also has new projects under way in China, the U.S., Mexico, Turkey, and India. Subscribe to Microgrid Knowledge’s free newsletter for the latest on microgrid projects, opportunities, policy, regulation, and financing. Also, join us on LinkedIn for discussion with microgrid experts and insiders.